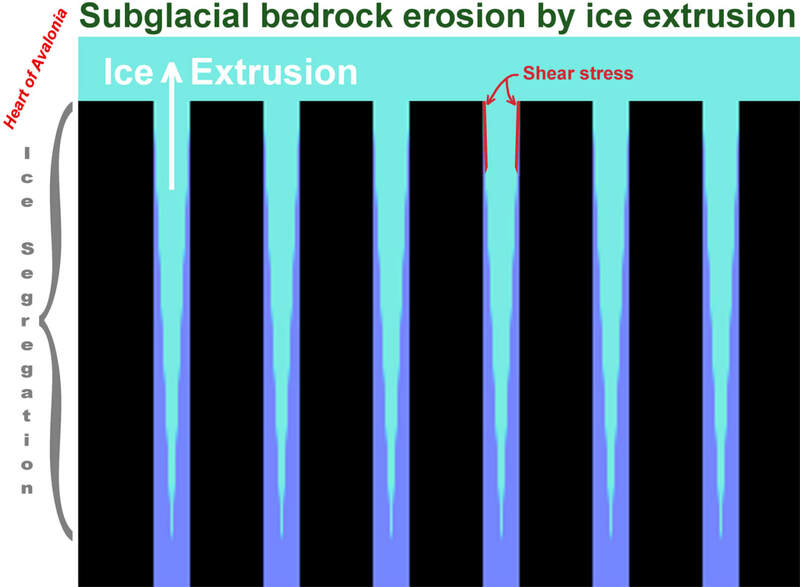 Subglacial ice extrusion describes a process in which ice crystallizes within bedrock and is then forced (extruded) from bedrock into adjacent cold, thick glacial ice. 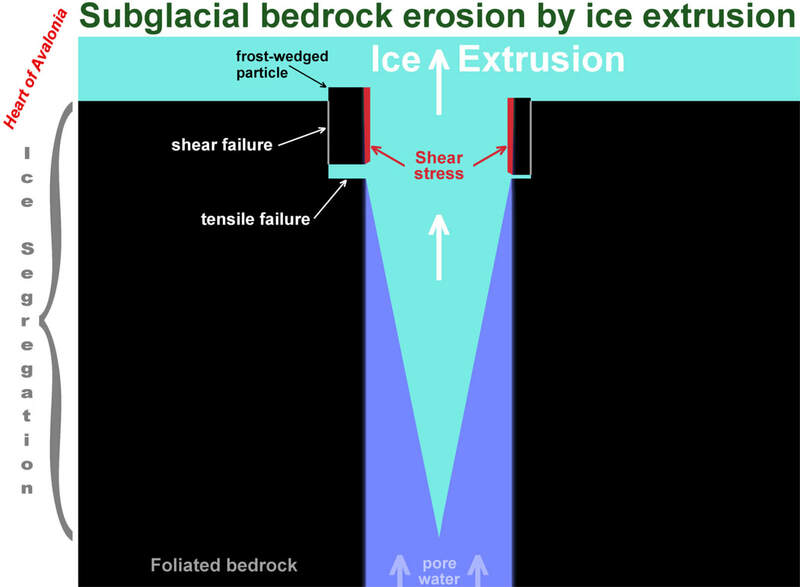 The ice-extrusion process entails ice creep occurring in thin regions arbitrarily close to an ice-rock boundary and, correspondingly, the process generates high levels of shear stress in the rock guiding the deforming ice. The shear stress can cause a patterned erosion of foliated bedrock. This patterned erosion then characterizes sections of bedrock that have been affected by subglacial groundwater migrating to the frozen ice-bedrock interface. The subglacial hydrogeology of an area can be investigated by observing the layout of zones where bedrock erosion by ice extrusion is evident. More significantly, the mechanisms by which various types of frozen bedrock conduct groundwater toward a cold glacier bed can potentially be inferred from observations of subglacial hydrogeology. It is important to distinguish bedrock erosion by subglacial ice extrusion from other erosion processes. Failure to make the distinction can lead to most erosion patterns being interpreted as subaerial erosion patterns that formed during the 10000 year interval since deglaciation. A number of observations will be presented in this section and in subsequent related sections, aimed towards building confidence that erosion of bedrock by subglacial ice extrusion forms part of the geologic record on the Avalon Peninsula of Newfoundland and that occurrences of erosion by ice extrusion can be identified with a reasonable lack of ambiguity. Each of the above photos shows a suspected instance of bedrock erosion by subglacial ice extrusion. 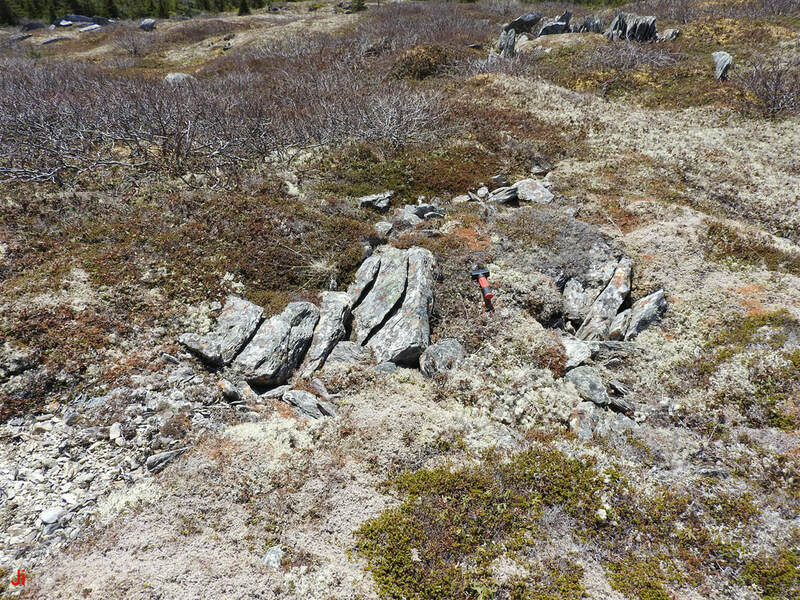 Abundant occurrences of severe subglacial bedrock frost heave were observed near the individual locations where each photo was taken. The last (bottom, right) photo shows the top of a large frost-heaved bedrock monolith. 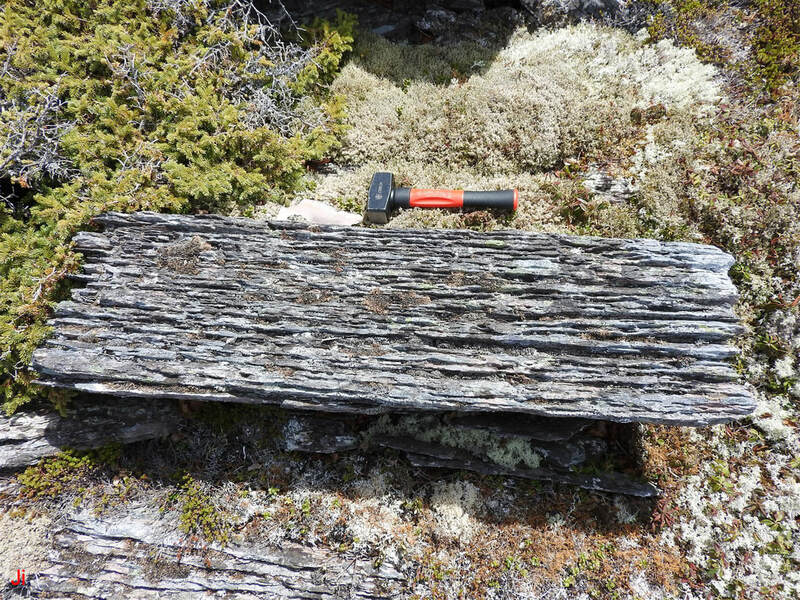 The second (top, right) photo shows erosion on the side of a very large (multi-hundred tonne) block of bedrock that was dislodged by glacial and/or frost-heave action and turned on its side. The yellow tape measure reads 18 cm, extending into an eroded groove. All six of the examples of suspected erosion by ice extrusion occur in strongly foliated, regionally metamorphosed sedimentary bedrock possessing small, homogeneous grain size (fine sandstone, siltstone or mudstone). 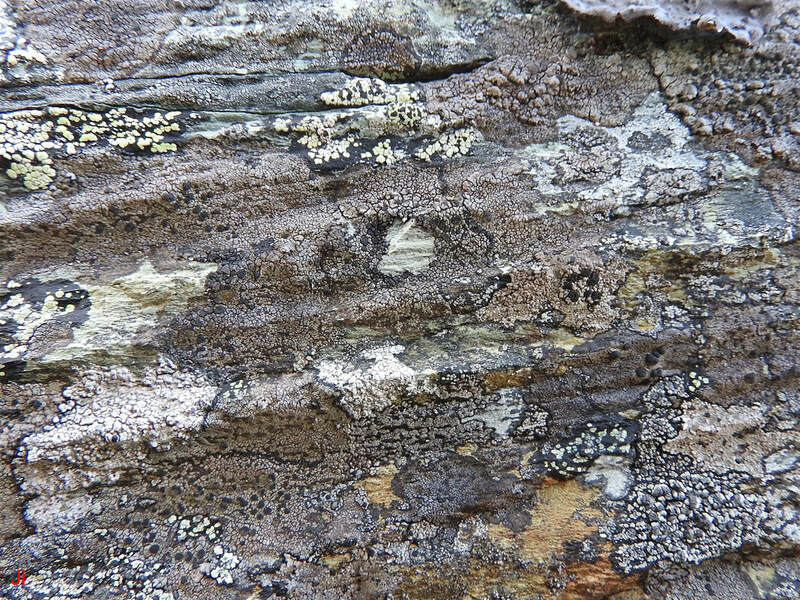 The rock was of Ediacaran age, well indurated, and seemingly highly resilient to Holocene freeze-thaw weathering or to erosion by rainfall or the action of vegetation. 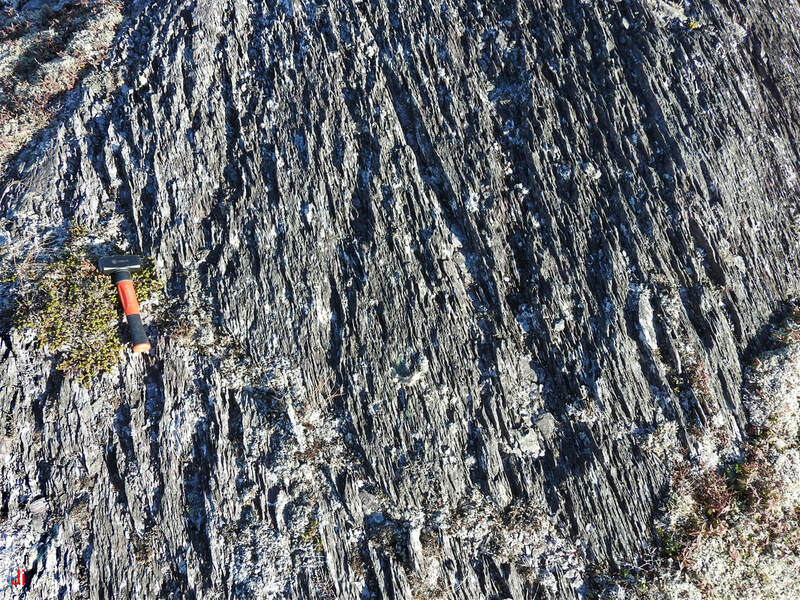 Patterned erosion similar to that illustrated above is also found accompanying frost heave in strongly foliated metasomatized volcanic rock on the Avalon Peninsula. The Subglacial Ice Plume model and the Basic Model for subglacial bedrock frost heave describe a mechanism by which pressurized groundwater can arise in subglacial bedrock during deglaciation under cold-based glacial conditions. This groundwater-supply mechanism is assumed to operate in the following description of the subglacial ice extrusion process. No determination of how groundwater moves within frozen, foliated, phyllosilicate-rich bedrock has yet been worked out, although the overriding goal of the present observations is to gain some understanding of this key process. 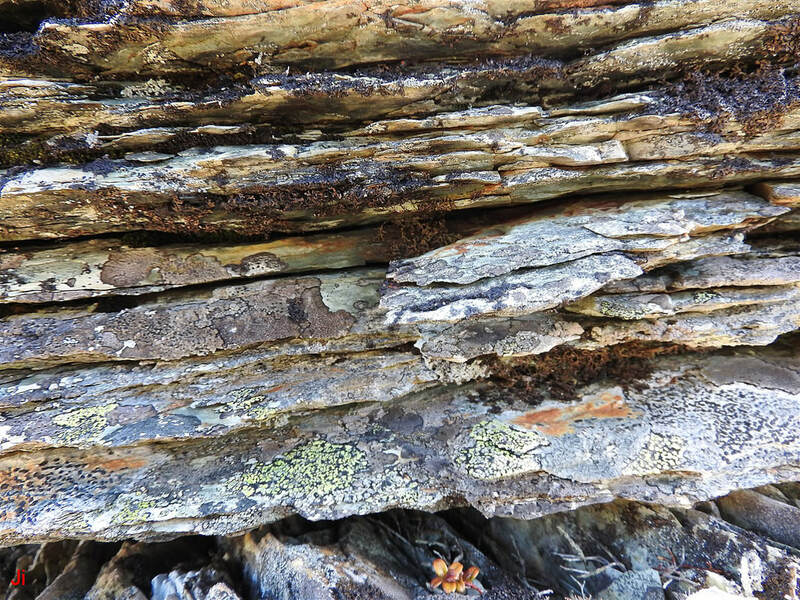 No indications of erosion by ice extrusion have been observed in bedrock that is not strongly foliated. Usually, affected bedrock shows a slatey or schistose texture. The above diagram shows a V-shaped erosion slot formed by subglacial ice extrusion in foliated bedrock. The pressure driving the ice extrusion arises from a combination of hydraulic pressure (pore water pressure) and ice-crystal growth pressure. Note the zone of high shear at the edges of the slot. Unless the rock yields in shear at the edges of the slot, ice creep velocity is forced to zero at the surface of contact with the rock. Assuming the rock is composed of phyllosilicate crystals aligned by ancient tectonic compression (plane of crystal alignment is parallel to vertical lines in diagram), the shear strength of the rock parallel to the plane of crystal alignment will be low. The horizontal scale in the above diagram has been greatly exaggerated in comparison with the scale of the previous diagram. The above diagram shows how shear stress acting on particles of crystal-aligned phyllosilicate rock can cause the rock to fail in shear and begin to move in tandem with ice being extruded from a narrow channel. This process acts to widen the channel and thereby accelerate further ice segregation and creep. The primary driver of rock failure and consequent erosion in narrow channels is ice crystal growth pressure. Another view of subglacial ice extrusion is shown above, with an intermediate horizontal scale. Small grains, or larger fragments of rock, can be dislodged by the intense shear stress characterizing the illustrated ice extrusion process. Observations point to subglacial ice extrusion having occurred under a hundred meters or more of glacial ice cover, where hydrostatic pressure would exceed 1 MPa. In this environment, cavitation would be costly in terms of energy and therefore unlikely to occur. All voids created during rock displacement would be penetrated by super-cooled groundwater or filled by deformation of adjacent ice. The above diagram shows particles of rock cleaved from the sides of a slot formed during subglacial ice extrusion. The slot can begin existence at near molecular dimensions and then grow wider and deeper as successive layers of phyllosilicate crystalline grains are peeled off. 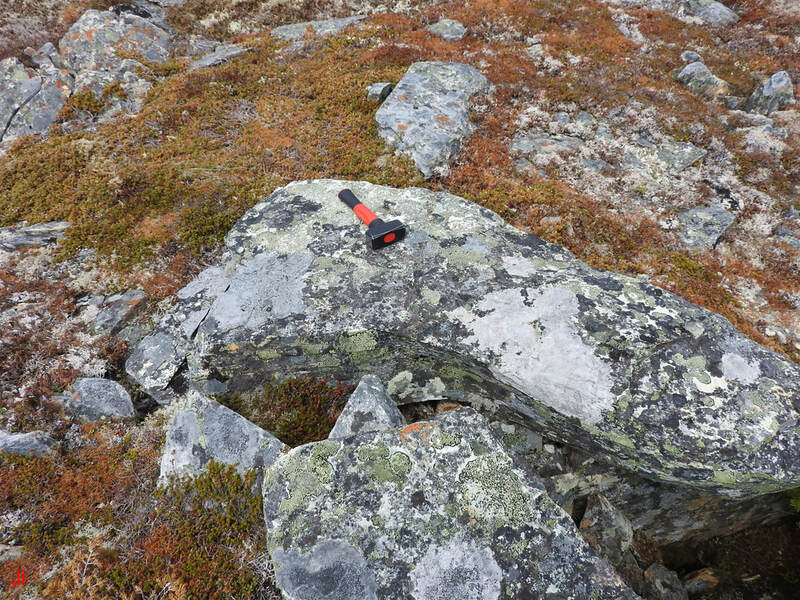 When bedrock is eroded in this mode, the resultant fine-grained debris is readily removed from the site by glacial ice flow or by wind or rainfall occurring post-deglaciation. 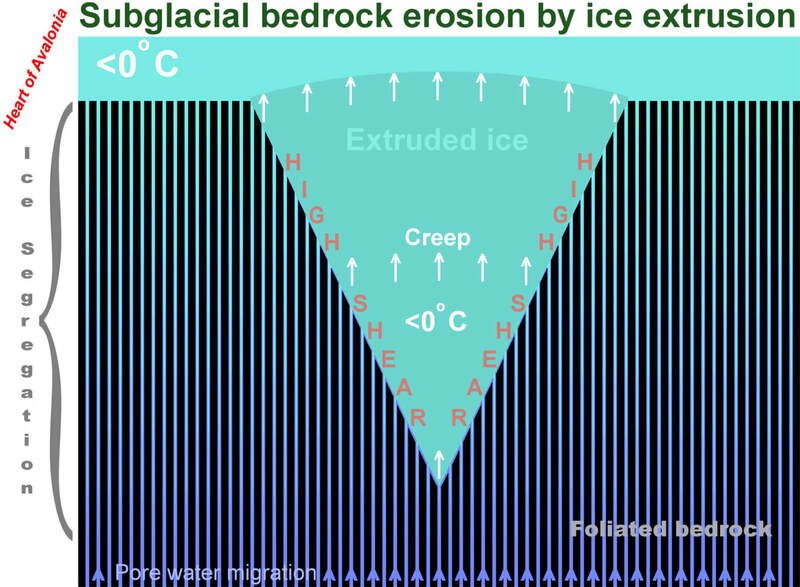 The subglacial erosion process embodies a positive feedback loop whereby ice accumulation and ice creep is accelerated within a widened slot, this in turn accelerating erosion along the sides of the slot. The widened slot can preferentially channel pore water moving in adjacent bedrock. Growth of the slot is limited by the availability of nearby pore water. An explanation along these lines could account for the periodic nature of ice-extrusion erosion patterns that are frequently observed. An alternative mode of bedrock erosion by ice extrusion is illustrated above. This erosion mode comprises a small-scale bedrock frost heave process whereby fragments of rock bounded primarily by planes of foliation are expelled in conjunction with extruded ice. The fragments may or may not be large enough to have survived at the site until the present day. Observations suggest that the rock failure mode illustrated in the above diagram might be quite common. A possible example is shown below. The above photo shows shards of resilient rock lying near a possible outcrop of bedrock affected by subglacial ice extrusion. The thin fragments appear to be associated with the frost heave activity evident in the immediate area. If this association is valid, the presence of the shards would support the model of subglacial ice extrusion illustrated in the preceding diagram. At many locations on the Avalon Peninsula light-weight shards of rock like those seen above would be scattered during windstorms. However, some locations, including that shown above, are sheltered from severe wind by surrounding hills. Several types of observational evidence can be used to help separate bedrock erosion patterns formed by subglacial ice extrusion from other types of patterned erosion. It must be recognized that lineated bedrock erosion patterns can arise under a number of general circumstances unrelated to the highly specific conditions presently under consideration. Something as simple as water running down a slope can create a repeating pattern of eroded channels. 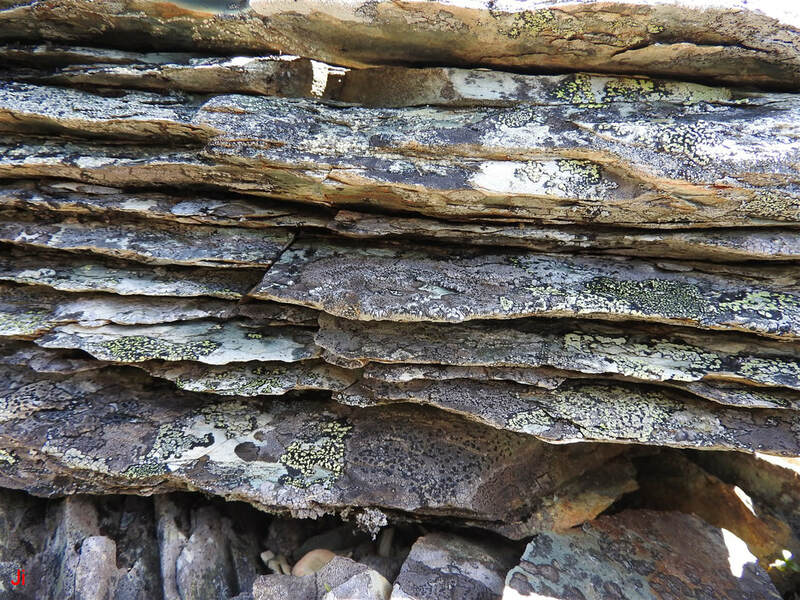 Any layered or foliated rock will tend to erode at different rates along different layers and the boundaries between layers can tend to concentrate the action of erosive processes. The following list provides five criteria that might be used to separate erosion by ice extrusion from other, more general, types of erosion. 1) Close association with bedrock frost heave. When an erosion pattern appears exclusively or preferentially in close association with occurrences of bedrock frost heave, the pattern is likely to be connected in some way with the frost heave process. 2) Severity of erosion. Much of the Ediacaran bedrock on the Avalon Peninsula is highly resistant to erosion and has retained erosion patterns laid down by basal slip glacial erosion. Well defined grooves and striations of glacial origin indicate a generally low extent of post-glacial erosion of the hosting bedrock. All nonglacial erosion affecting bedrock surfaces on the Avalon Peninsula has accumulated in 10000 years, a relatively brief interval. 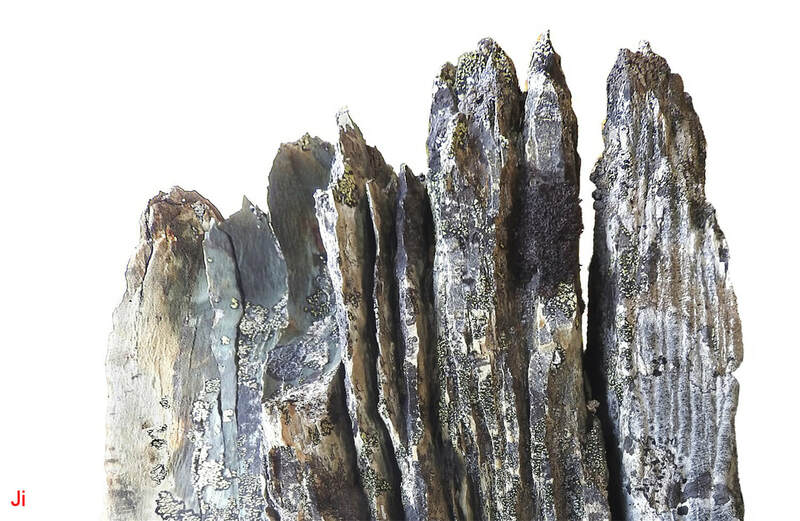 Some minerals, notably hydrothermal quartz, erode very little under the action of rainfall or freeze-thaw weathering during a 10000 year interval. When quartz veins traverse bedrock, erosion of the bedrock around the quartz is evident by a protrusion of quartz above the bedrock surface. This indication of bedrock erosion rate is applicable primarily when both quartz and the host bedrock have been initially smoothed to a level surface by basal slip glacial erosion. 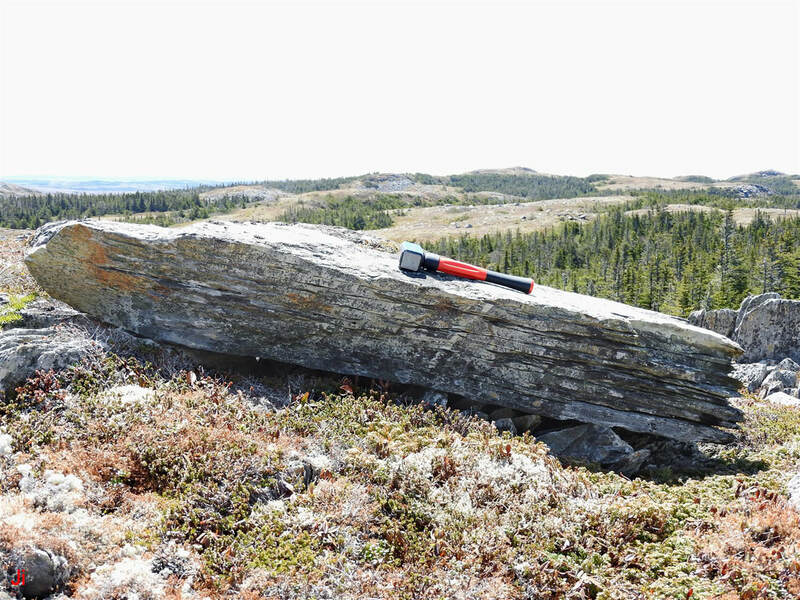 Based on observations around the Avalon Peninsula, it can be concluded that erosion depth (thickness of rock removed in 10000 years) is usually less than 2 cm and often is in the range 0 - 1 cm. A notable exception occurs in rock that is susceptible to chemical attack by water, acid, oxygen or carbon dioxide. 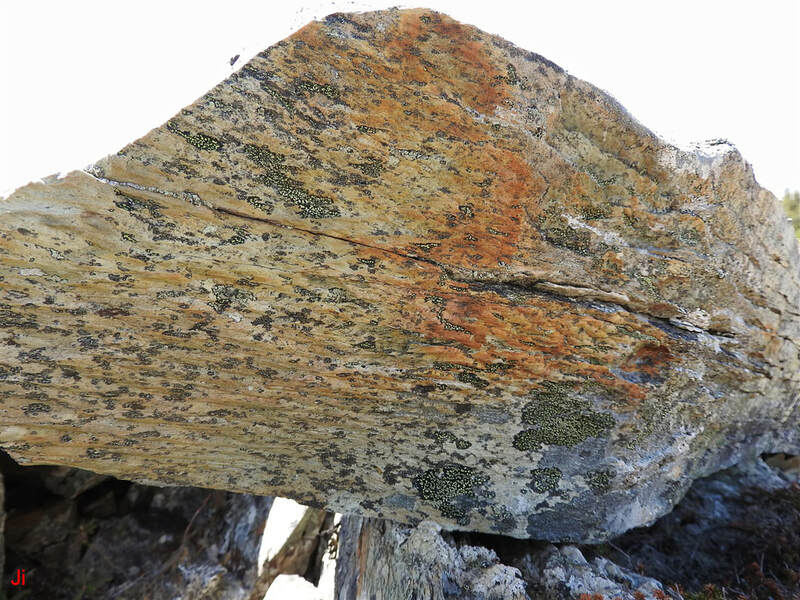 Granite is a good example of this exception where the chemical erosion of feldspar rapidly undermines the integrity of the rock. Outcrops of volcanic rocks containing mafic minerals are also vulnerable to chemical attack and accelerated freeze-thaw weathering. Ancient siltstones, mudstones, sandstones and conglomerates, dating from the Ediacaran and well indurated by tectonic compression, thermal metamorphism and penetration by hydrothermal fluids, seem highly resistant to erosion by rainfall or freeze-thaw weathering. These rocks, along with metasomatized felsic igneous rocks (originally flows, tuffs and ignimbrites) have preserved various artifacts of glacial erosion to an extent suggesting that little post-glacial erosion has taken place. When bedrock types typically displaying minimal evidence of post-glacial erosion are seen to be eroded and fragmented to an exceptional degree, a glacial-period erosive process must form a significant component of any attempt at interpretation. 3) Differences in erosion patterns on nearby similar rock. When adjacent areas of similar bedrock experience large differences in the extent of erosion, it becomes difficult to account for the observed variations in erosion rates in terms of variations in local weather or surface runoff. Rather, differences in glacial ice pressure or groundwater penetration become more probable explanations. Some frost-heave affected areas demonstrate zones of lightly-eroded, glacially smoothed bedrock lying adjacent to zones of more aggressive, patterned erosion even as rock type and topography (slope, drainage of water) remain unchanged across the boundary between the severely eroded and less eroded zones. 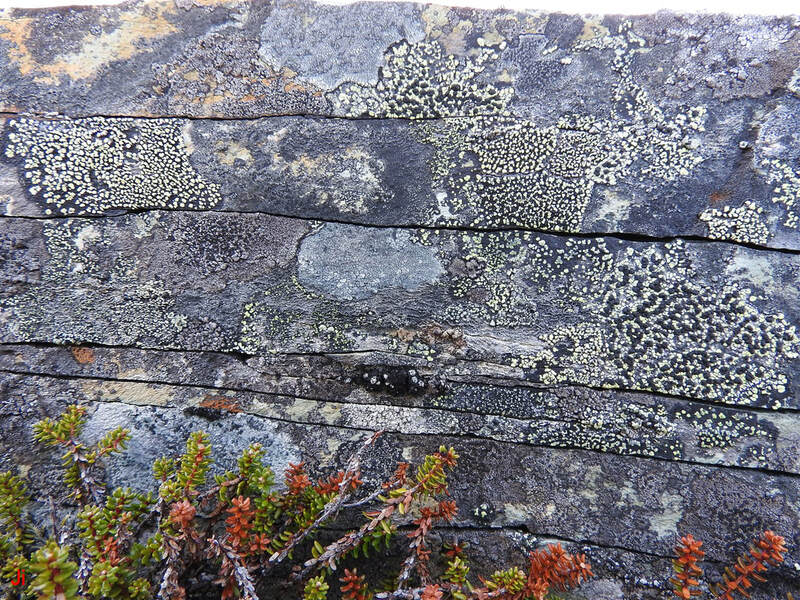 4) Patterned erosion beneath glacial erratics. When patterned erosion in an open area is observed extending beneath a glacially deposited boulder (erratic), the lack of any observable change in the character of the erosion pattern as rock transitions from an exposed environment to a sheltered environment can point toward a conclusion that the erosion occurred before the erratic was placed (hence the erosion was subglacial in origin). 5) Asymmetry of extent or pattern of erosion on symmetrically equivalent faces of glacially displaced blocks. Differently oriented bedrock surfaces can experience different erosion patterns when the surfaces are not symmetrically equivalent. 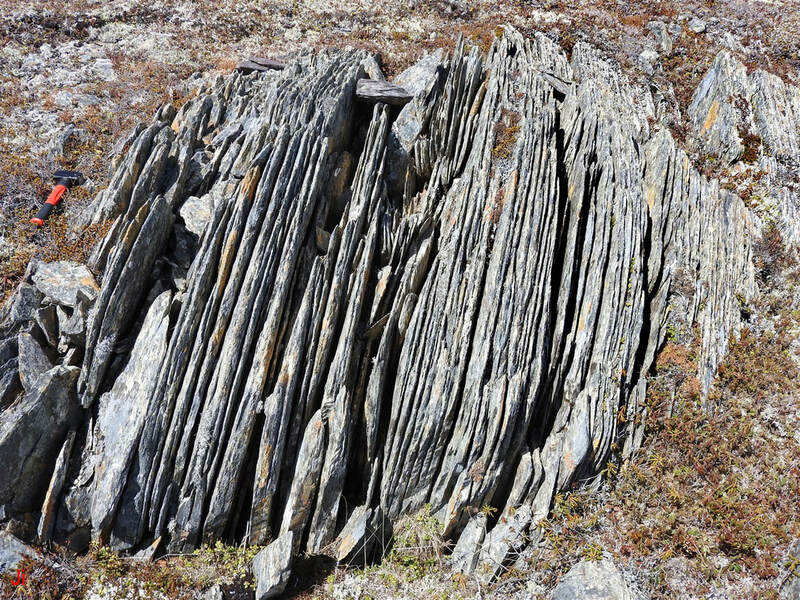 For example, in foliated bedrock, a planar rock surface running orthogonal to the plane of foliation would likely erode differently from a surface oriented parallel to the plane of foliation. Similarly, a planar bedrock surface oriented horizontally (parallel to earth's surface) might erode differently from a surface oriented vertically (perpendicular to earth's surface). In bedrock that has not been glacially displaced, these intrinsic asymmetries persist from the subglacial environment to the current deglaciated environment. The rotation of a bedrock polyhedron (for example, a joint block) by glacial action changes the intrinsic asymmetries originally present in the unshifted bedrock. For example, given a 90 degree rotation of a rectangular block about a horizontal axis, a top surface will switch to become a side surface. If the original top surface was perpendicular to the plane of foliation (a common situation) then, following rotation, this surface becomes one of four side surfaces that remain perpendicular to the plane of foliation. There is no longer any intrinsic asymmetry in the four side surfaces. Holocene erosion should affect all four side surfaces equivalently, ignoring variations potentially caused by differences in sun angles and prevailing winds. The original top surface is not symmetrically equivalent to the other three side surfaces with respect to erosion that might have occurred before the rectangular block became rotated. Differences in erosion on symmetrically equivalent surfaces of glacially displaced blocks can be used to infer that some or all of the observed erosion was subglacial in origin. This kind of analysis can provide a convincing criterion for separating Holocene erosion from glacial-period erosion. While each of the five criteria listed above can help to separate instances of bedrock erosion by subglacial ice extrusion from weathering that occurred during the Holocene, the fifth criterion provides the least ambiguity in making the assessment. The symmetry argument can be particularly effective because an asymmetric erosion pattern must be explained in terms of an asymmetric erosion environment or an asymmetric substrate or both. 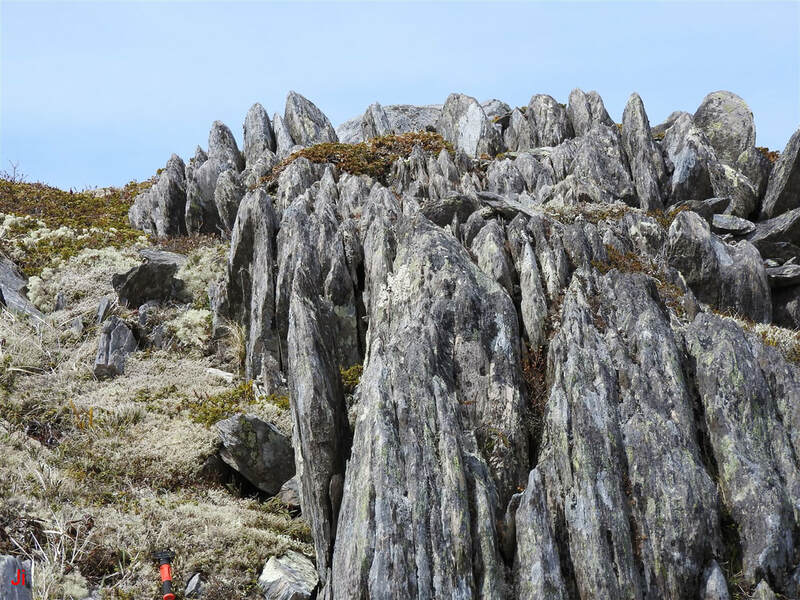 Aspects of all five of the above criteria will be used to assess instances of bedrock erosion described in this section and in subsequent sections related to the topic of subglacial ice extrusion. Criterion #5 will be used initially in this section to demonstrate that ice extrusion erosion patterns are distinct and recognizable and that they can reasonably be separated from erosion patterns resulting from other weathering processes. Then the remaining four criteria will be used to help identify the subglacial erosion patterns in a range of settings. 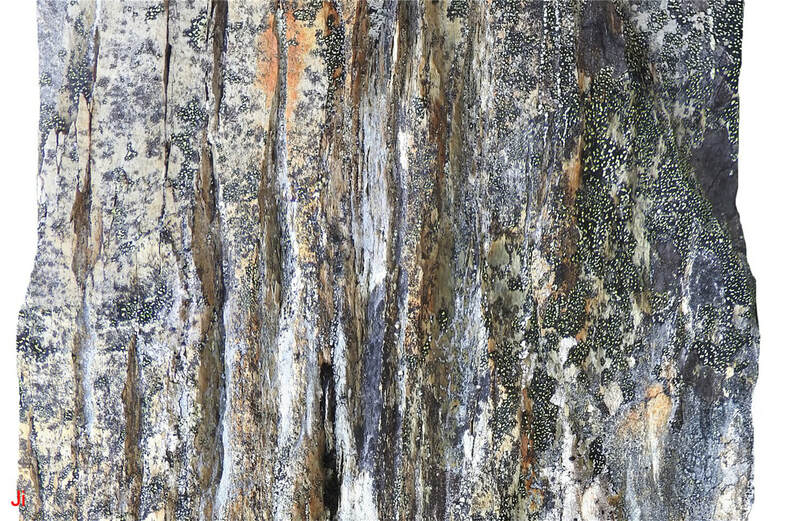 Two views of a glacially transported boulder are shown in the above pair of photos. The view directions differ by 180 degrees. 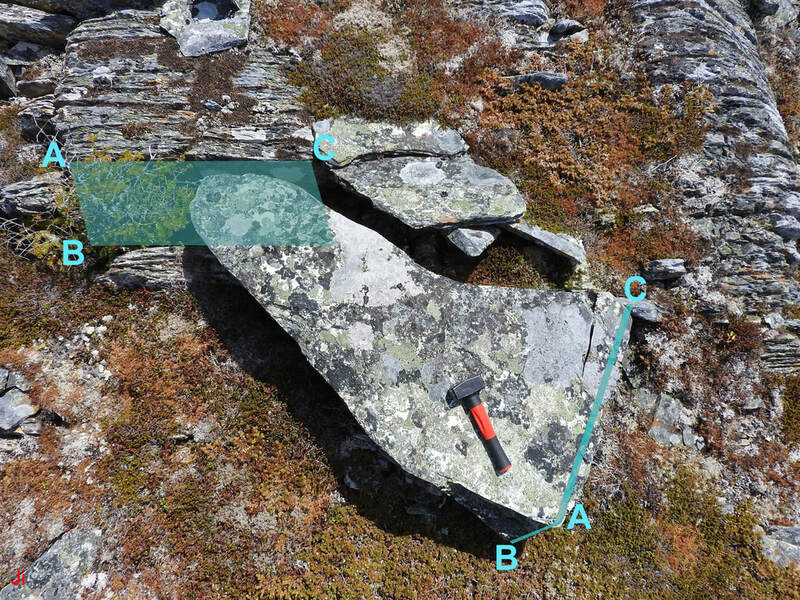 The tape measure seen in the first (left) photo shows 45 cm to the top surface of the rock. 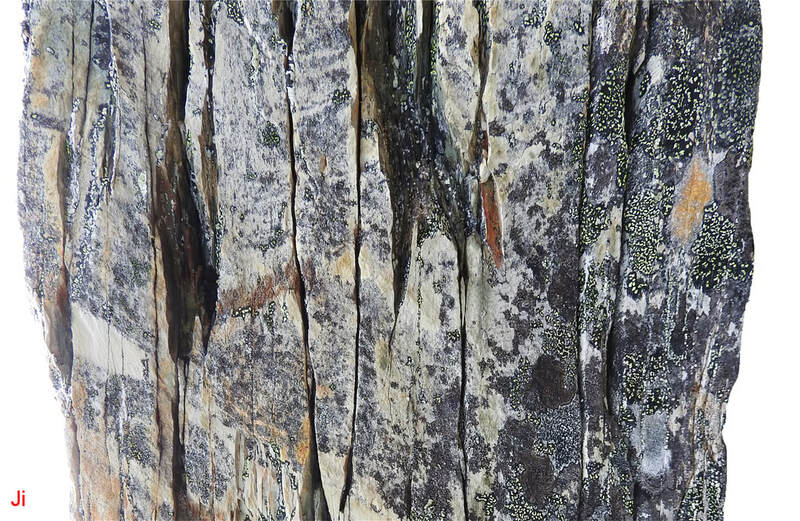 Note how the boulder shows deep grooves on the side facing the camera in the first (left) photo ("front" side), while equivalent grooves are largely absent in the surface of the rock facing the camera in the second (right) photo ("rear" side). 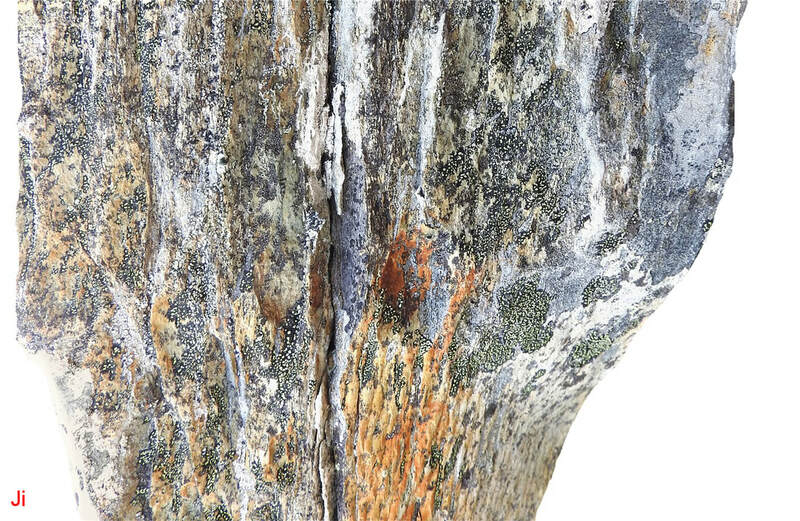 Although the integrity of the boulder appears to be compromised by joints visible on the rear side, the boulder remains all in one piece and the top segments are not loose. The rock comprising the boulder is a strongly foliated, fine-grained, sedimentary rock. At the boulder's present orientation, the foliation runs parallel to the ground. 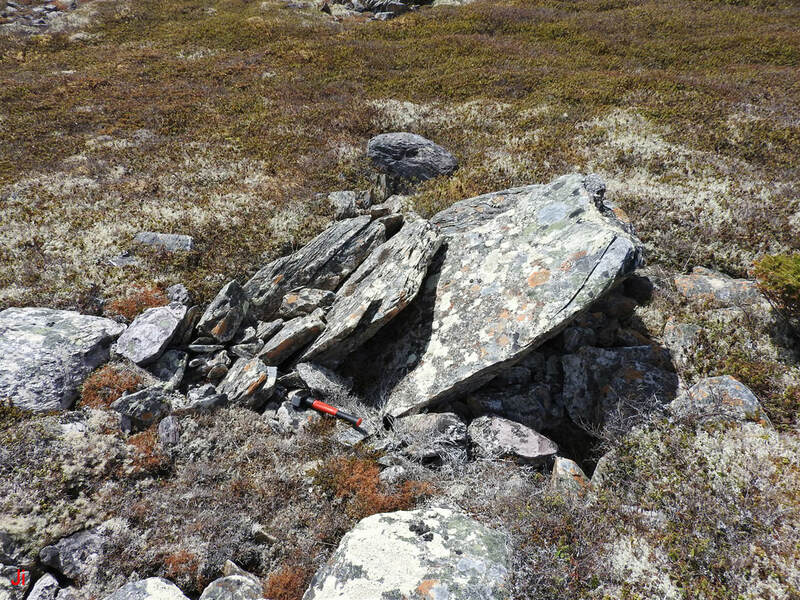 The boulder closely resembles bedrock found outcropping in the surrounding area and appears to have separated from a very large block of glacially disrupted rock lying about 10 m away in a direction that was determined to be up-ice at this location. Bedrock underlying the site is strongly foliated everywhere, with the tectonically-aligned foliation dipping vertically. Presumably, the illustrated boulder has rested at its present location and orientation throughout the Holocene. The rock, as positioned, possesses intrinsic (that is, ignoring the shape of the rock) cylindrical symmetry about a vertical axis. All sides of the boulder that are orthogonal to the ground are therefore intrinsically symmetrically equivalent. A question then arises as to why the extents of erosion on the front and rear sides of the block are so different. Differences in sun exposure (for example, greater warming and greater day/night temperature variations on the south side of the boulder vs. the north side of the boulder) or differences in prevailing winds (potentially driving rain or snow preferentially into joints on one side of the rock) could theoretically account for differences in rates of erosion. One way to test this possibility was to find other similar glacially transported blocks in the nearby area showing similar erosion asymmetries. Several were found but with their more-eroded sides and their less-eroded sides facing in a variety of different compass directions, including 180 degrees opposite to the orientation of the boulder illustrated above. 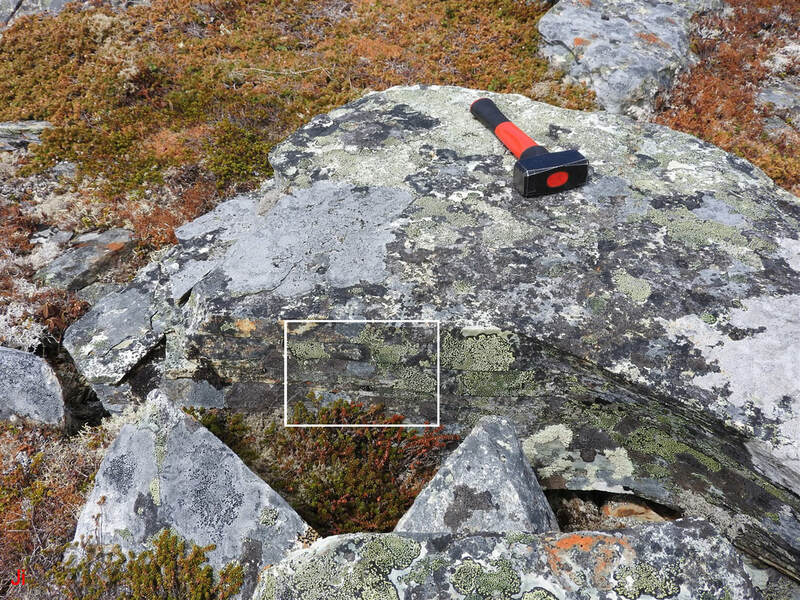 The boulder illustrated in the above photos appears to have retained an erosion pattern that dates back to before the block was glacially rotated about a horizontal axis. At this prior time, what is now the front surface could have been a top surface. The asymmetry in the observed erosion pattern would then be an expected result of the lack of symmetric equivalence between the top of the block and the bottom of the block. 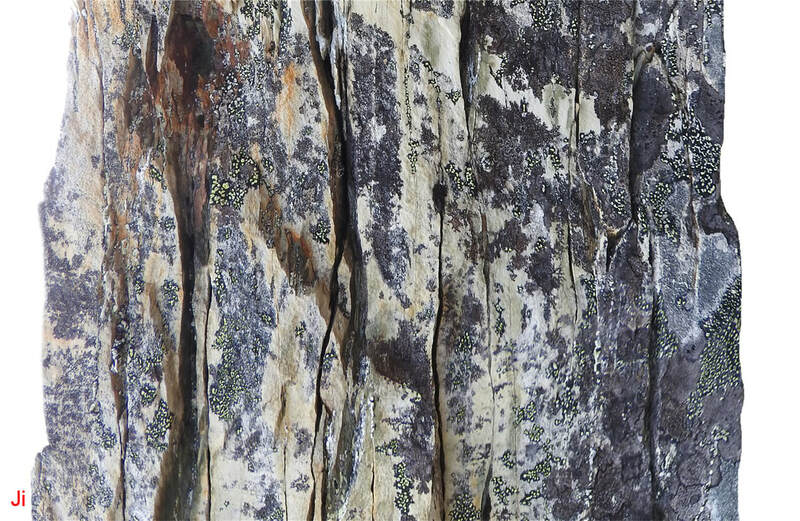 The strongly grooved erosion pattern seen on the boulder resembles erosion patterns seen on the top surfaces of nearby ice-disrupted bedrock exposures. 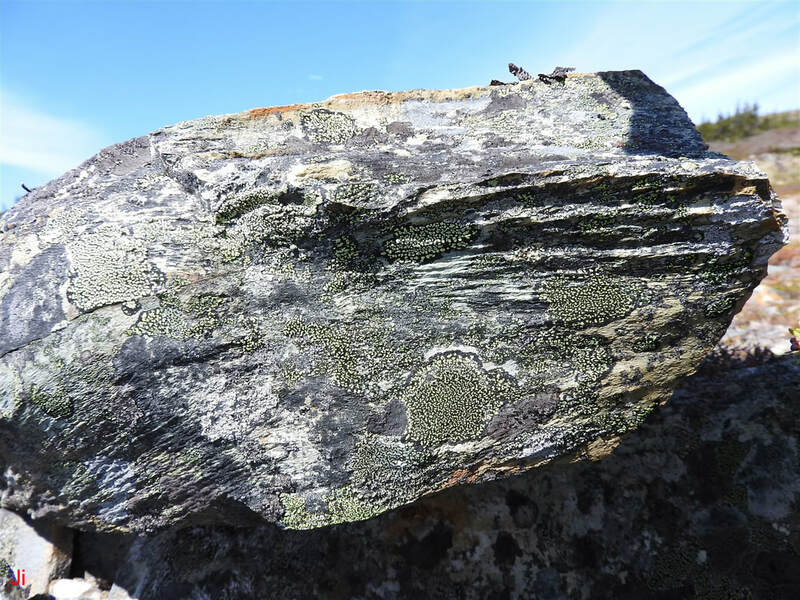 These observations suggest that the erosion pattern seen on the front surface of the boulder is a relict subglacial erosion pattern. The above photo shows an outcrop of ice-disrupted bedrock. The more darkly-shaded rocks seen just to the right of center in the frame are frost-heaved monoliths rooted in bedrock. The white circle surrounds a frost-heaved monolith that has been expelled from bedrock and then rotated about a horizontal axis through an angle close to 90 degrees. The present position of the block identified in the circle suggests that the block was aligned by glacial ice creep (see Technical Note 7 - Alignment of joint blocks by ice creep). The left photo above shows the toppled frost-heaved monolith, while the right photo shows a bedrock exposure 110 m away that could be used to determine ice flow direction. 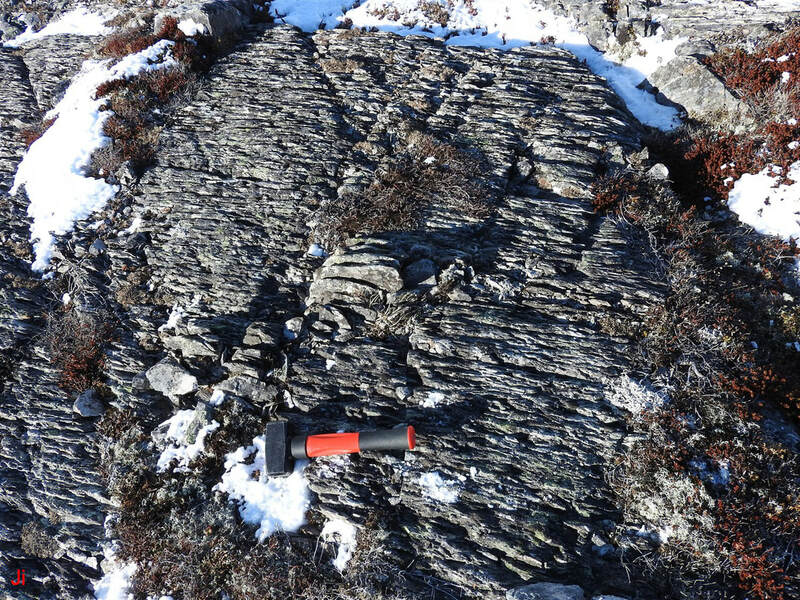 Glacial striations visible in the right-hand photo indicated basal slip ice motion occurring in the direction 243 degrees true. There is no certainty that if and when glacial conditions transitioned from warm-based conditions to cold-based conditions the indicated ice flow direction would be conserved. However, based on observations of nearby rotations of frost-heaved bedrock, it appeared that ice flow direction did not change appreciably at this location when the glacier base became frozen to the bedrock. Two nearby examples of rotated frost-heaved bedrock are shown below. 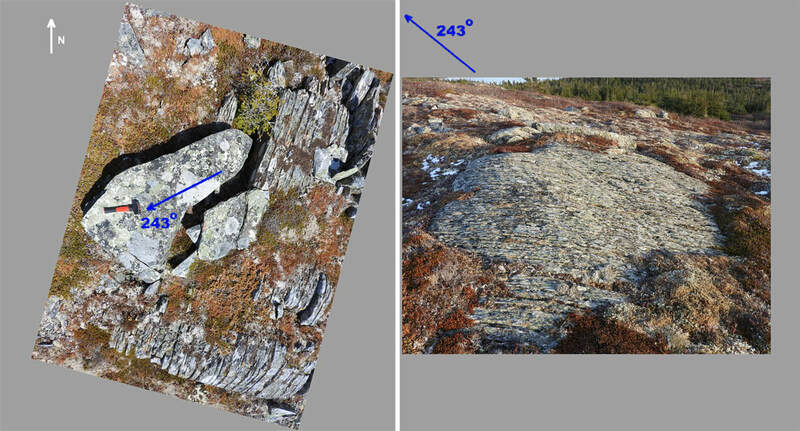 The rotated frost-heaved monolith shown in the first (left) photo above was situated about 20 m north of the primary site of interest, while the group of rotated monoliths shown in the second (right) photo was situated about 130 m west of the site of interest. Both of the rotations shown above were directed top-westward. 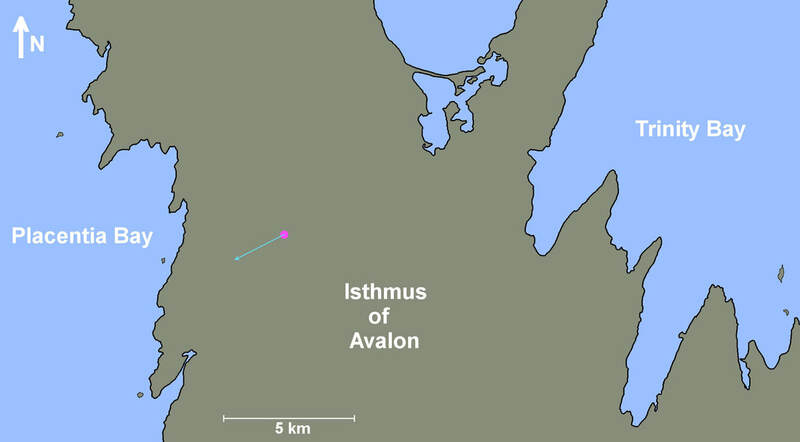 The map shown below indicates the location of the site of interest relative to the coast of the south section of the Isthmus of Avalon. The cyan arrow extending from the magenta dot on the above map shows the indicated ice flow direction (243 degrees) at the primary site of interest. The expelled frost-heaved monolith is shown above. A small tree occupies part of the cavity from which the monolith was apparently displaced. The flat slabs of rock seen just behind the monolith are detached pieces of frost-heaved bedrock that have been rotated by apparent glacial action, but not translated. The rotation of these slabs further supports the assessment that glacial ice at the location of interest was moving in a direction just south of due west. These slabs appear to have been aligned by glacial ice creep. The letters shown in the above layout photo can be used to correlate the positions of corners of the rotated frost-heaved monolith with corners of the cavity from which it was expelled. Most of the motion of the block was via rotation. The lack of translation implies zero ground-level glacial ice motion as would be characteristic of a cold-based glacier moving by creep only. The simple and limited motion of the expelled frost-heaved monolith make it a good candidate for examination to determine the possible effects of subglacial erosion on its surfaces. Clearly, the rectangular surface extending vertically downward from the line A-C was a former top surface. Subglacial erosion by ice extrusion would be expected to primarily affect this surface. Side-on views of the monolith are shown below. The first (top, left) photo shows the original top surface of the block, now facing approximately southwest. The second (top, right) photo shows the original bottom of the block, now facing approximately northeast. The third (bottom, left) photo shows the northwest-facing side of the block, while an oblique view of the southeast-facing side of the block is shown in the fourth (bottom, right) photo. The photos show a distinct difference in the degree and nature of erosion on the various surfaces. 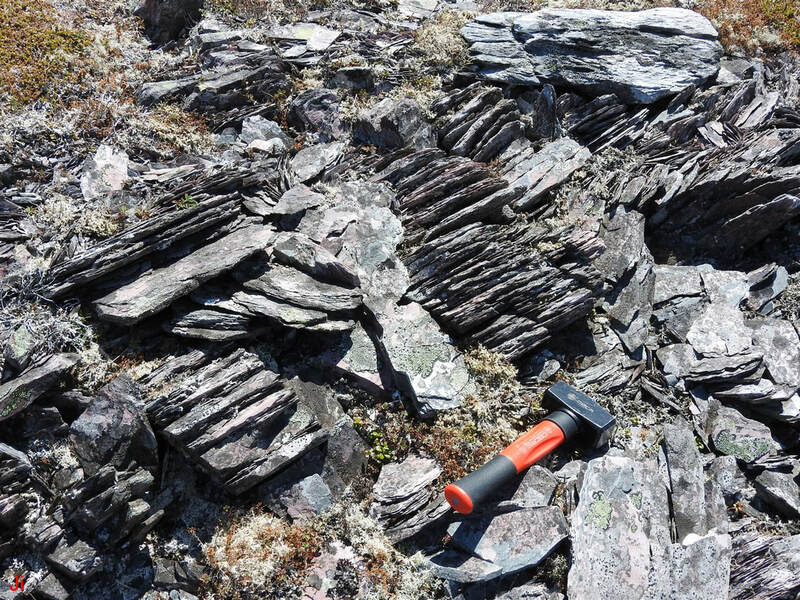 As with the previous example in this section, the plane of foliation in the rotated block lies approximately parallel to the ground and there is no clear reason why Holocene erosion processes would not attack all vertically-oriented surfaces of the rock roughly equally. The original top surface of the monolith has experienced a disproportionate amount of erosion when compared with the other surfaces. The following series of photos shows a detailed view of the northwest-facing side of the block. The photos provide an 8-section sequential view of the side of the block as it would have looked had the block remained at its initial (unrotated) orientation. Moving down from the top of the 8-layer sequential view to the bottom, a change can be noted in the degree and character of the erosion on the illustrated northwest-facing side of the block. The degree to which the side surface of the block is indented with grooves diminishes with the depth of the rock below the ground surface prior to frost heave. The position-dependent character of the erosion pattern seen on the side of the block suggests that the erosion pattern is unlikely to be the sole result of weathering during the interval when the block was lying at its present orientation. Assuming that part or all of the erosion occurred in a subglacial environment before or during a subglacial frost heave event, the form of the erosion can be analyzed to help understand how water and ice moved through the rock. This same type of analysis can then be repeated on several different frost-heaved bedrock occurrences in an attempt to reduce the interference stemming from secondary (Holocene) erosion processes. The widening and deepening of the V-shaped indentations appearing in the upper (before frost-heave) portion of the block suggests a process of erosion by ice extrusion as described earlier in this section. A question arises as to why indentations are seen on the side of the block rather than only on the top. It is possible that ice pressure caused wedges of rock to detach from sides of the monolith before the monolith was lifted. The detachment initially took the form of joint widening only, but when a detached wedge of rock was lifted clear of adjacent bedrock by the upward motion of the whole monolith, the detached wedges could fall loose and be scattered. This explanation cannot fully account for the gradual widening of side grooves approaching the top of the block. These side grooves resemble top grooves, although they are more subdued. If the side grooves seen near the top of the block are the result of subglacial ice extrusion, then their presence implies that ice continued to emanate from the upper portion of the block after the bottom of the block was detached from underlying bedrock by frost heave. Continuing motion of ice through the detached monolith is puzzling. Was the ice moving via creep through narrow channels, or, did pressurized ice at the base of the partially-lifted block reenter the block as pore water (reverse ice segregation)? Several widened joints can be seen extending vertically along portions of the monolith. These joints roughly follow planes of foliation. None of the joints divide the block into separate pieces. Why are the joints wide enough to be visible? If the joints were widened by freeze-thaw weathering during the Holocene, or by the action of vegetation, why did the block not split completely apart? Did these joints carry water or ice toward the surface during the interval when frost heave and/or ice extrusion was occurring? Was rock along the sides of the joints compromised by ice crystal growth pressure or by shear stress leading to its preferential disintegration under Holocene weathering? Answering these questions will require further understanding of the process by which groundwater moved through the frozen bedrock. For purposes of comparison with the side view presented above, a detailed set of closeups scanning across the original top (now southwest facing) surface of the block is provided below. The preceding set of six photos shows an ordered sequence of closeup views of the southwest-facing side (original top) of the expelled frost-heaved monolith. Note the lack of variation in the degree and character of the erosion as the view is scanned from the northwest edge of the face to the southeast edge. 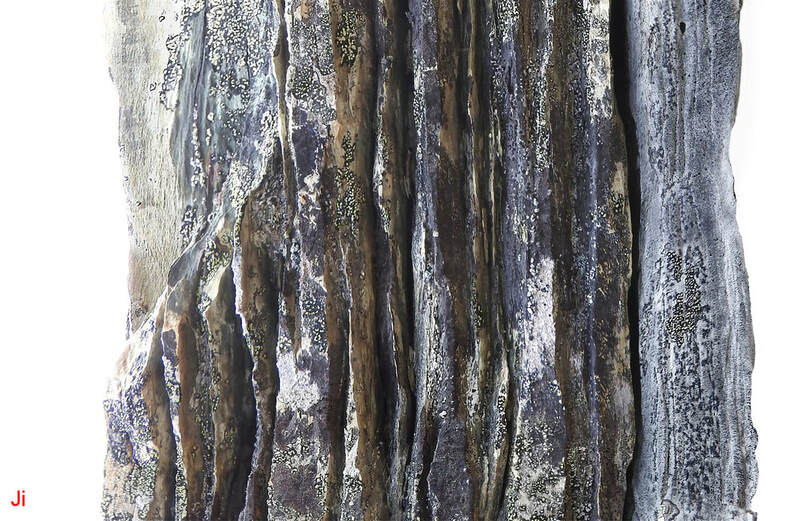 It is possible that a portion of the severe erosion seen in the above six photos was generated by Holocene weathering exploiting surface indentations. 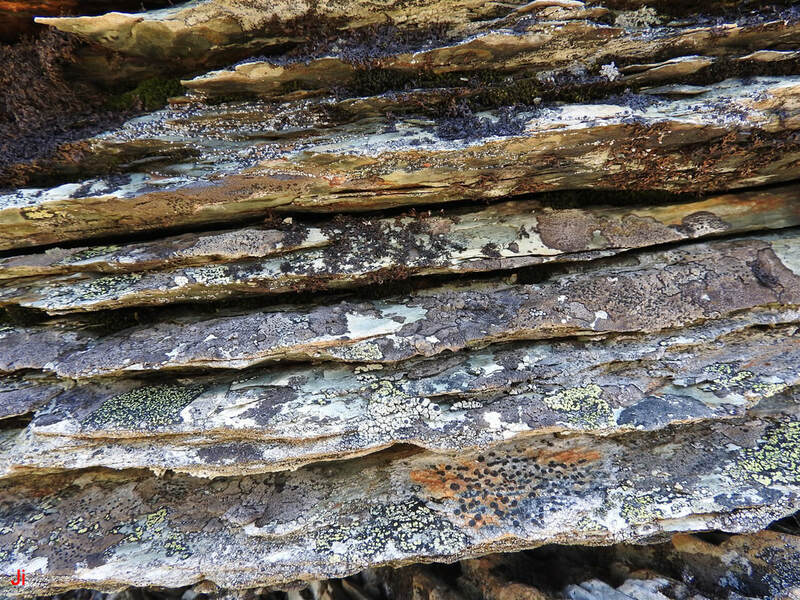 The growth of lichen and other vegetation is favored on a deeply indented rock surface and the presence of vegetation can dissolve rock and wedge layers of rock apart. However it appears likely that acceleration of erosion by vegetation would be a secondary effect and that the primary cause of the deeply indented surface was subglacial erosion. In some cases the deep indentations seen on the original top surface of the block are connected to visibly widened joints extending downward into the block. A question arises as to whether the ice pressure that created the top grooves then wedged the underlying rock apart, widening the joints, or whether the underlying joints fed water/ice upward, leading to the formation of the grooves. Observations to date suggest the second explanation is more likely. While pore water seems able to move through frozen foliated rock without requiring the presence of visibly widened joints, widened joints appear to consolidate pore water flow or to facilitate the flow of segregated ice. The southeast-facing side of the monolith shows little evidence of grooves created by erosion, although joints are still visible. Views of the southeast-facing side of the rock are shown below. The above photo shows part of the southeast-facing side of the expelled frost-heaved monolith. This side surface lacks the prominent eroded grooves that characterize the southwest-facing (original top) surface of the block. A closeup of the area enclosed by the white rectangle is shown below. The surface shown in the above photo would be expected to experience conditions for erosive attack during the Holocene that would approximately match the conditions affecting the southwest-facing (original top) surface of the expelled monolith. 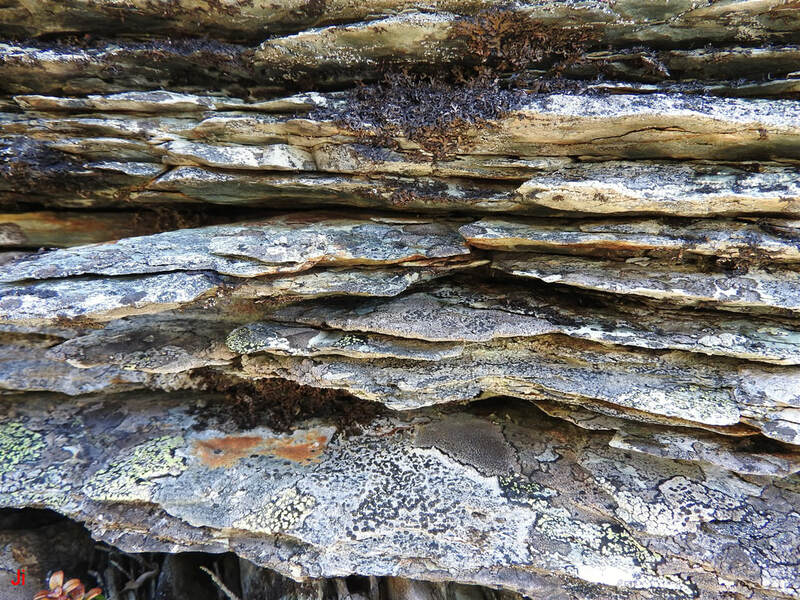 The widened joints apparent in the rock would permit the penetration of meteoric water and the accompanying possibility of freeze-thaw weathering. 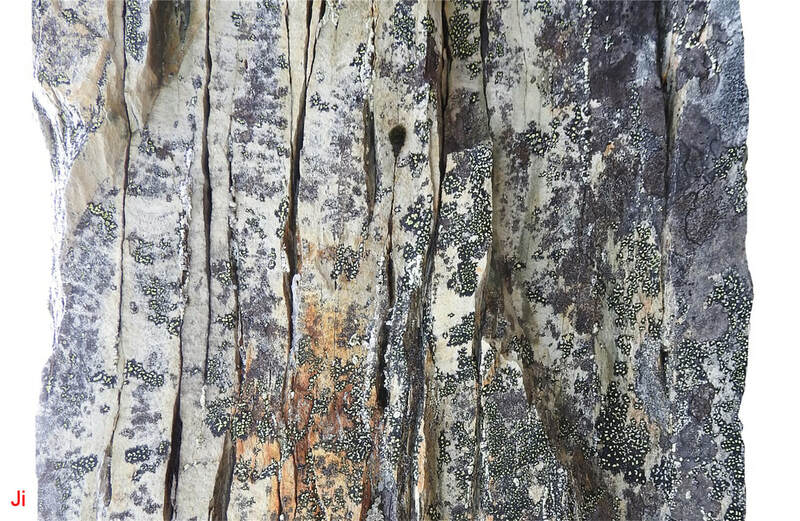 Lichen and other nearby vegetation could cause wedging or chemical attack on the rock, exploiting the joints as lines of entry. 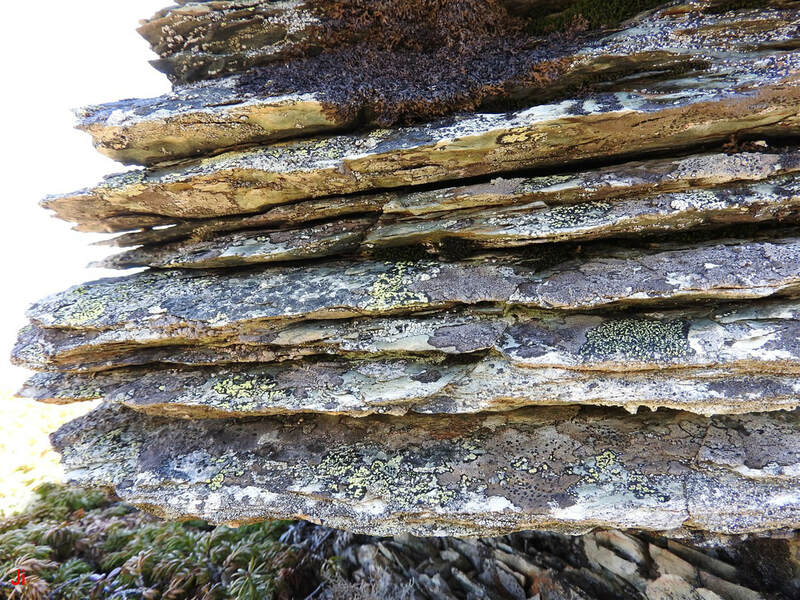 The lack of significant erosion along the edges of the joints suggests that the rock comprising the monolith possesses a high degree of resistance to weathering under Holocene conditions. The argument that the deeply eroded southwest-facing (original top) surface reflects erosion that occurred prior to the Holocene is supported by a comparison of the original top surface with the side surface shown above. 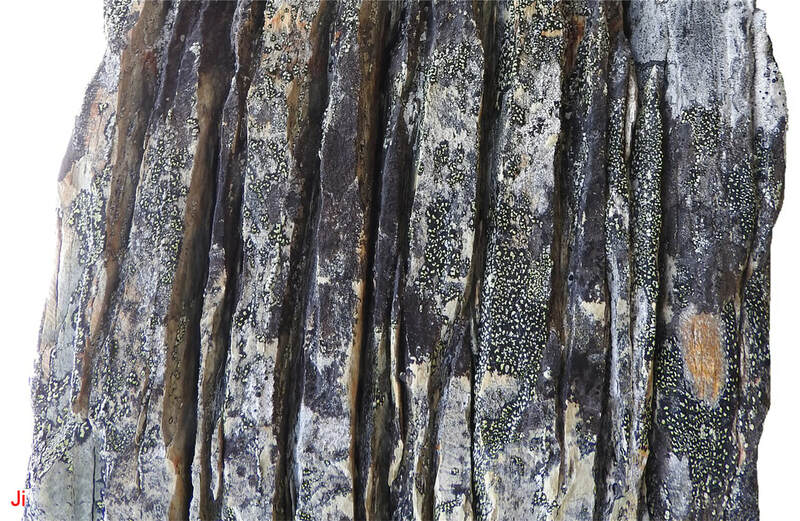 A question remains as to whether the widened joints seen in the above photo are an artifact of Holocene weathering or whether these joints were created and possibly widened under subglacial conditions. The monolith is composed of well indurated regionally metamorphosed fine grained sedimentary rock. 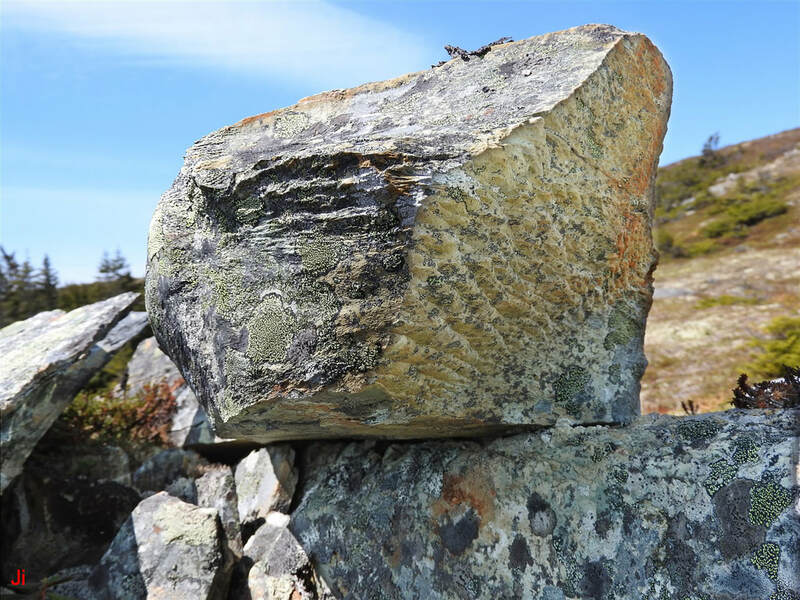 This rock type, abundant on the Avalon Peninsula, appears to be highly resistant to delamination along planes parallel to the tectonically induced foliation except in cases where the delamination has already been induced by processes that occurred at some point in the past. Thus, for example, it is typically difficult to cleave the rock by striking it with a hammer unless a distinct joint paralleling the foliation is already present. Past glacial action seems to have been particularly effective in delaminating the rock in areas that show significant frost heave. 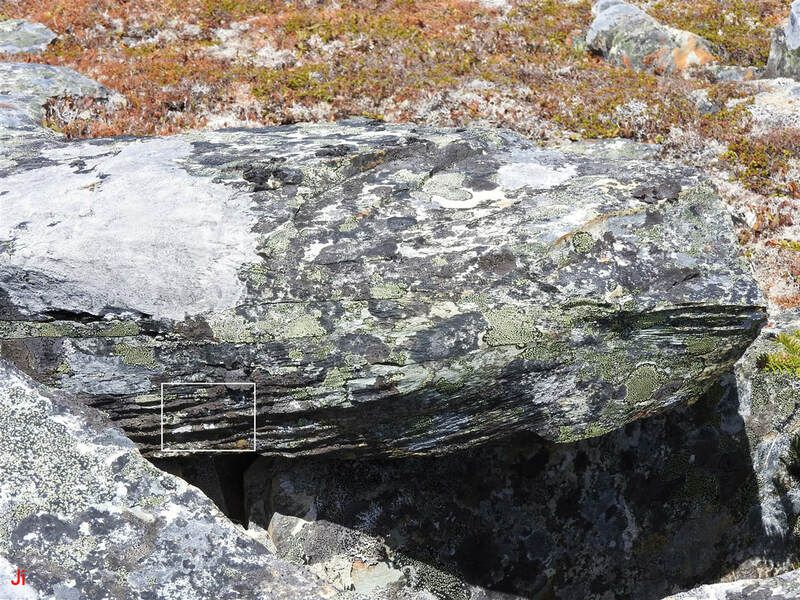 In other areas however, rounded erratics formed from the same type of rock appear to have survived glacial transport and 10000 years of Holocene weathering without delamination. It seems reasonable to conclude that the widened joints seen in the monolith above were formed at the molecular level by late-Pleistocene processes that occurred in a cold subglacial environment. These same processes could have led to the erosion by ice extrusion seen on the southwest-facing (original top) surface of the block. Widening of the joints to visible dimensions could have been the result of subglacial ice segregation or else, the widening might at least partially be the result of wedging or rock dissolution that occurred during the Holocene. The above photo shows a view of the southeast-facing side of the block near the original (before frost heave) bottom of the monolith. Note, that this portion of the block extends out over the cavity from which the block was displaced. The grooves seen at the bottom of the block are shallow and less pronounced than the grooves seen on the top surface. These grooves appear to be the result of the separation of the block from underlying bedrock. Without a cross joint providing a plane of failure, separation can occur by a combination of shear failure and tensile failure along multiple weaknesses paralleling foliation in the rock. Observations of the undersides of other frost-heaved blocks in the area show that this type of "tearing" failure is common. A very rough surface would be expected to result from foliated rock being torn into separate pieces by frost heave action. Holocene weathering could round the resultant irregular surface. A closer look at a suspected rock tear on the southeast-facing side of the monolith is shown below. The second (right) photo shows a closeup of the grooved surface seen in the white rectangle in the first (left) photo above. 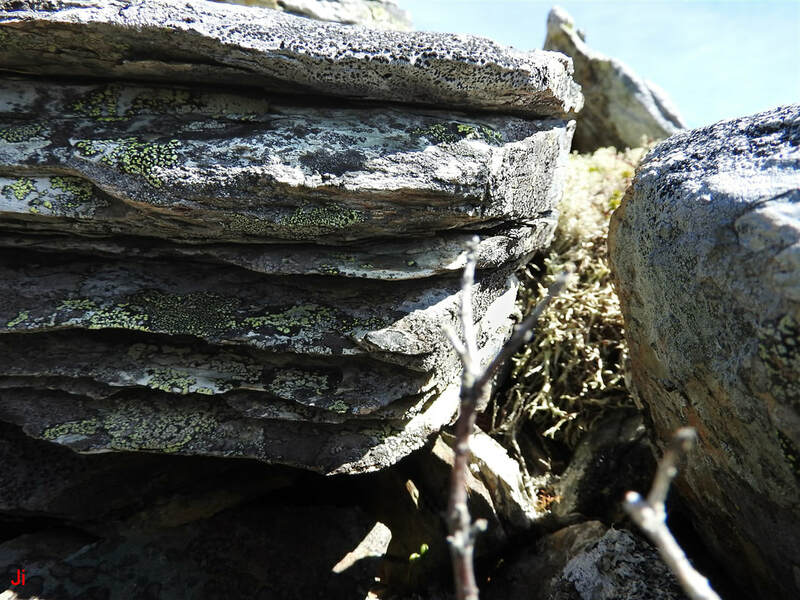 The gently grooved surface could be the result of rock separation that did not follow a cross joint or other plane of weakness. 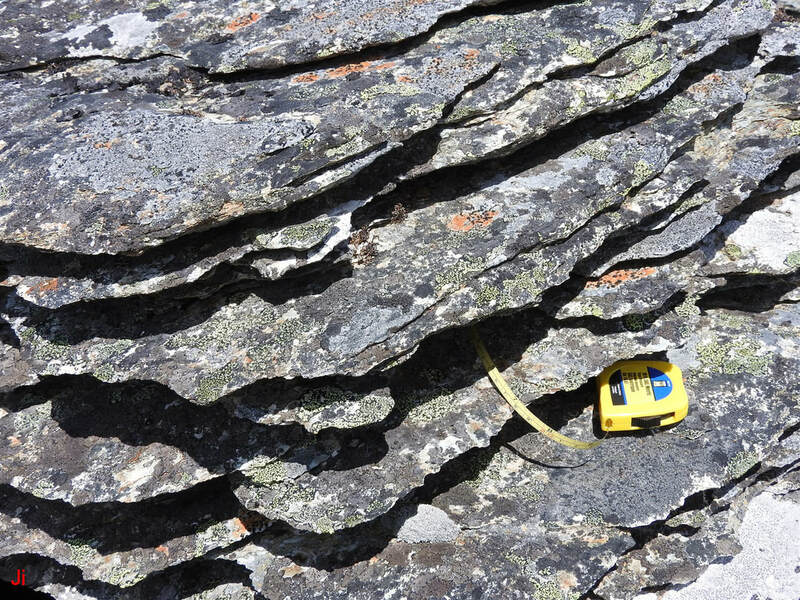 Rather, the rock separated by multiple small shear and tensile failures generally aligned with the plane of foliation. The resultant rough surface was rounded by rock dissolution during the Holocene. The grooves seen above superficially resemble grooves potentially formed by subglacial ice extrusion. There is no sure way to separate the two similar-looking erosion patterns in glacially transported blocks that have no clear distinction between original top and original bottom. Generally however, the grooves formed by rock separation are shallow and are not associated with widened joints paralleling foliation. A view near the original bottom, (now northeast-facing) surface of the monolith is shown above. Only one widened joint is visible at the original bottom of the block, whereas several widened joints paralleling foliation are seen in the block nearer to the original top surface. Based on observations of this block and others, it seems reasonable to deduce that groundwater or ice moved in widened joints as subglacial ice extrusioin and frost heave developed in the foliated bedrock. However, it does not seem likely that widened joints were the only pathway for migrating groundwater. Rather, the widened joints appear to become more abundant approaching the surface, where bedrock confinement becomes reduced. Clearly, water eventually reaching the surface from depth needed to move through confined bedrock before entering widened joints formed in near-surface less-confined bedrock. The transition in groundwater transport from confined to less-confined conditions can be investigated in elongated frost-heaved monoliths like the monolith shown above. Why investigate bedrock erosion by subglacial ice extrusion? There is no easy route to understanding the hydrogeology of frozen bedrock. Groundwater migration rates in frozen rock can be very low and direct measurement of groundwater movement at depth might require decades or centuries of observation. Frozen bedrock that is unglaciated will experience large fluctuations in temperature from day to night, summer to winter and because of changes in the weather. These temperature fluctuations can alternately freeze and thaw upper layers of bedrock, complicating efforts to interpret groundwater movements from observations made at or near the surface. Rainfall and seasonal snow cover would add further ambiguity to surface measurements of groundwater migration. Understanding the capacity of groundwater to move through frozen rock could help in understanding the behavior of cold-based glaciers in earth's polar regions. 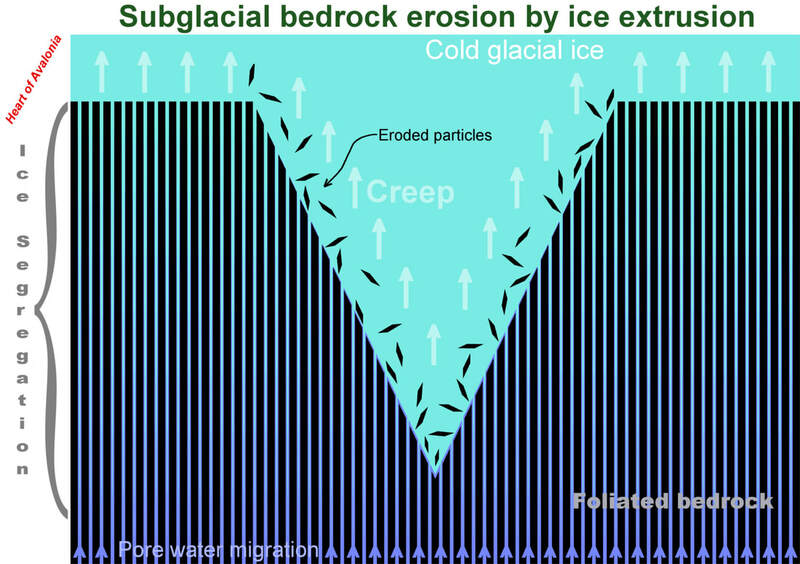 Near-ground ice creep is a combination of tangential ice motion and the non-tangential ice flow that results when ice is extruded from bedrock. The hydrogeology of frozen bedrock is also of interest in the broader context of planetary science. For example, most bedrock on Mars is now permanently frozen and a search for groundwater on Mars would be aided by an understanding of how groundwater at depth might migrate through frozen upper layers of bedrock to cause observable effects at the surface. The hydrogeology of Mars might also provide clues to the paleoclimate of that planet, especially as it relates to deglaciation and the eventual desiccation of the surface. Understanding the behavior of groundwater in frozen rocks on earth could aid in understanding whether rocks on Mars could accommodate similar patterns of groundwater migration. 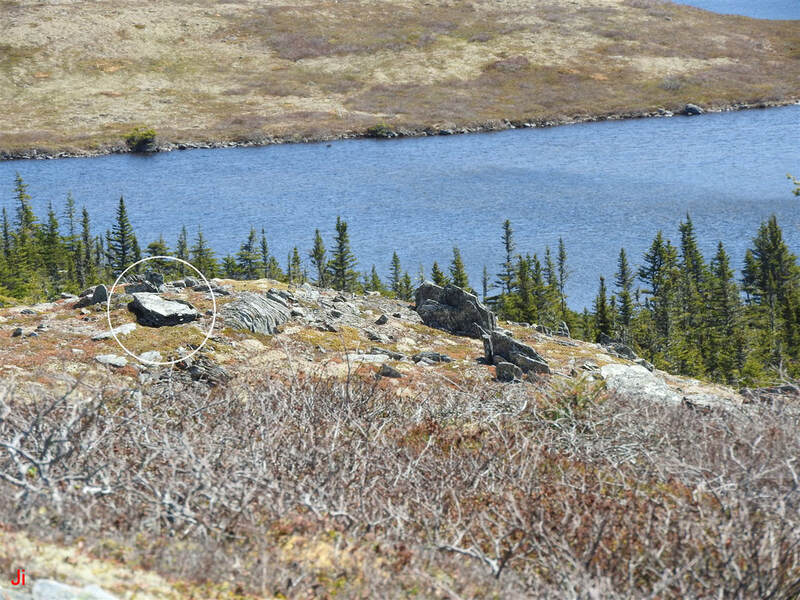 The subglacial environment existing on Newfoundland's Avalon Peninsula during the Younger Dryas cold period provided a set of circumstances potentially conducive to the analysis of the hydrogeology of frozen bedrock. The presence of thick cold-based glacial ice cover provided an environment where bedrock temperature and ambient pressure would change very gradually, with little influence from weather, seasons or precipitation. In such a controlled environment, groundwater migration could enter a steady-state condition potentially lasting for centuries. The ability of migrating groundwater to disrupt bedrock at the glacier/bedrock interface meant that a permanent record of past patterns of groundwater movement was created at what is now the surface. 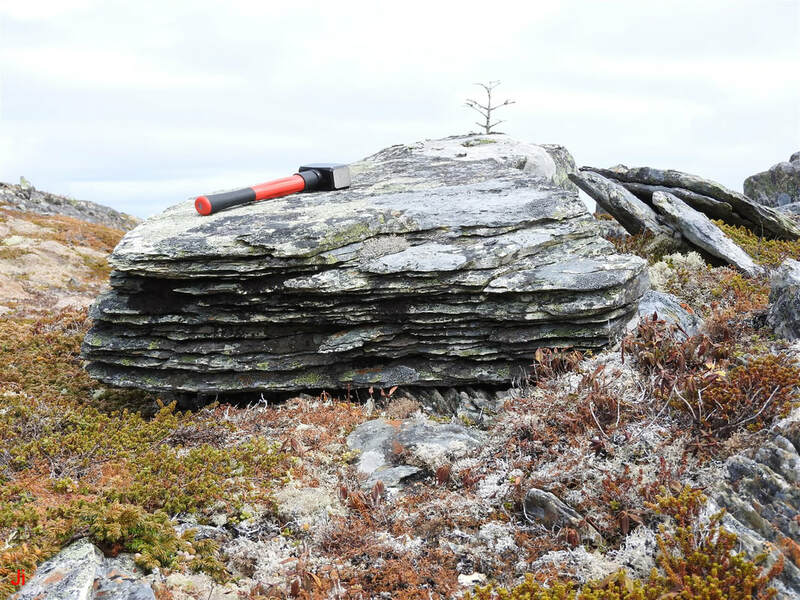 Investigating subglacial bedrock frost heave and bedrock erosion by subglacial ice extrusion on the Avalon Peninsula provides a means for accessing this record. Whereas bedrock frost heave is an inherently nonlinear and chaotic process, erosion by ice extrusion would be expected to be a more linear and less chaotic process. It might therefore be possible to infer rates of groundwater migration to the cold glacier base by observing the severity of bedrock erosion by ice extrusion. Rates of groundwater migration could provide indications of subglacial groundwater pressure and flow channels. The susceptibility of different rock types to penetration by groundwater under polar conditions can be potentially assessed by observing the degree to which different rock types are affected by erosion by ice extrusion. Understanding which rock types are most susceptible to groundwater penetration while frozen could help in determining the basic physics by which groundwater moves through frozen rock. 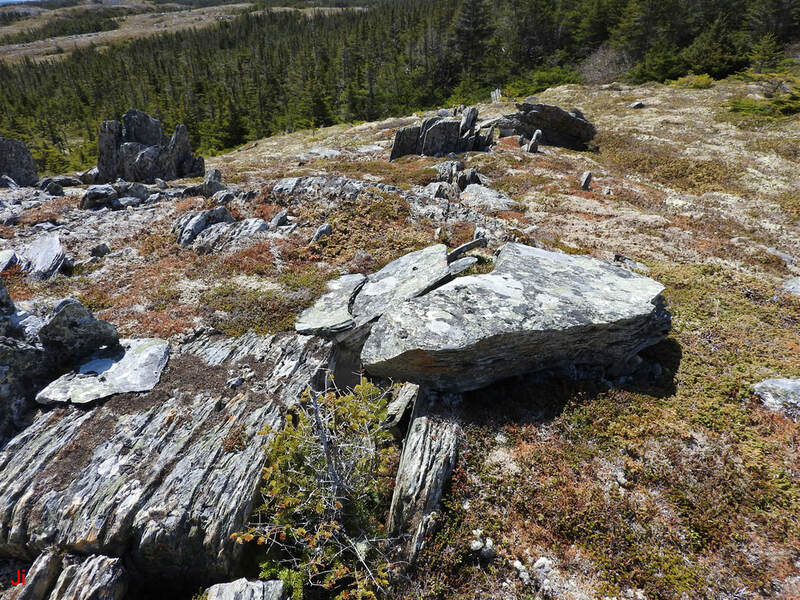 Bedrock erosion by subglacial ice extrusion appears to be a common process that has occurred over wide areas on the Avalon Peninsula of Newfoundland. Determining why this process occurred at many locations, but not at many other locations, can help in determining the climate history of the region and the conditions under which deglaciation occurred. This information could enable a better understanding of the climate fluctuations characterizing the Younger Dryas cold period and the transition to the Holocene.